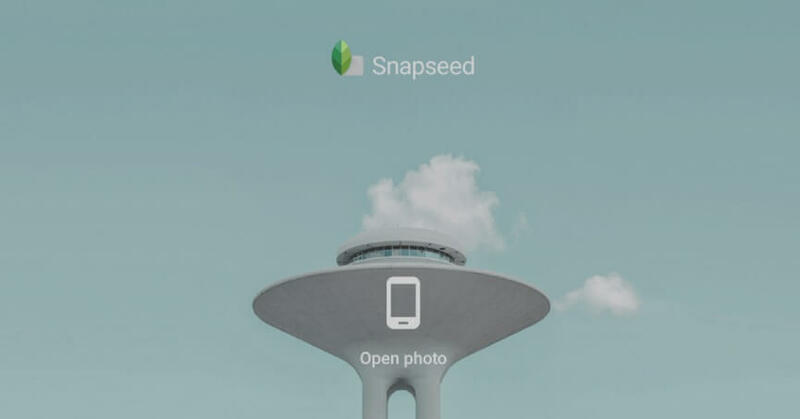 Snapseed is one of the most downloaded photo editing apps available for iPhones and Androids. It is extremely self-explanatory and easy to use, which has led to its high popularity. 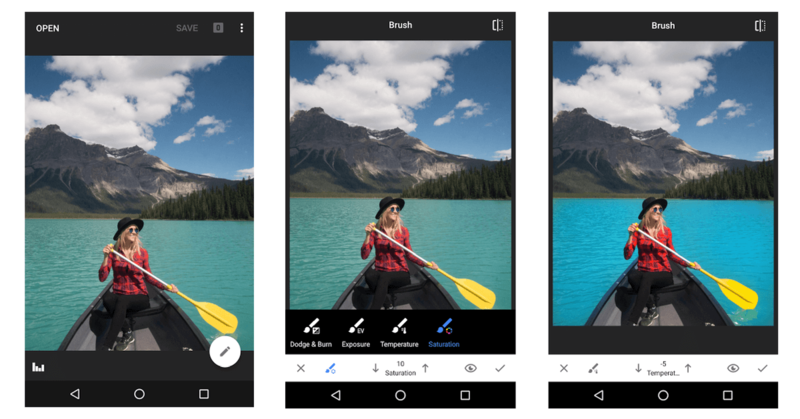 Besides the standard editing functions like brightness, crop, and contrast, Snapseed is also loaded with extra cool features like the brush, ambiance, and perspective. 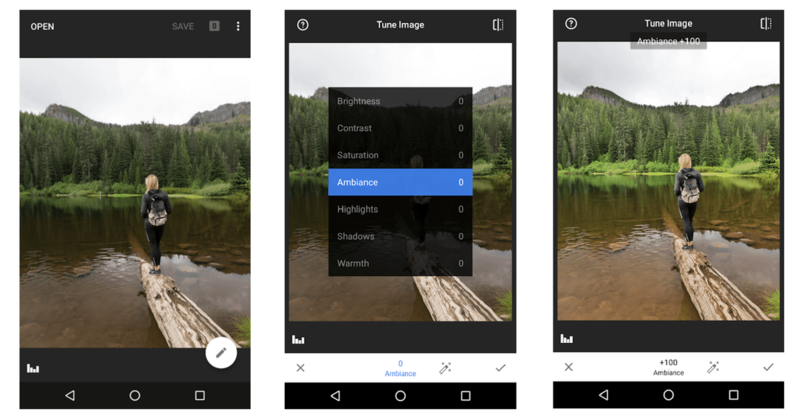 Let’s cover some of the top Snapseed features and how you can use them to make your Instagram feed look stunning. 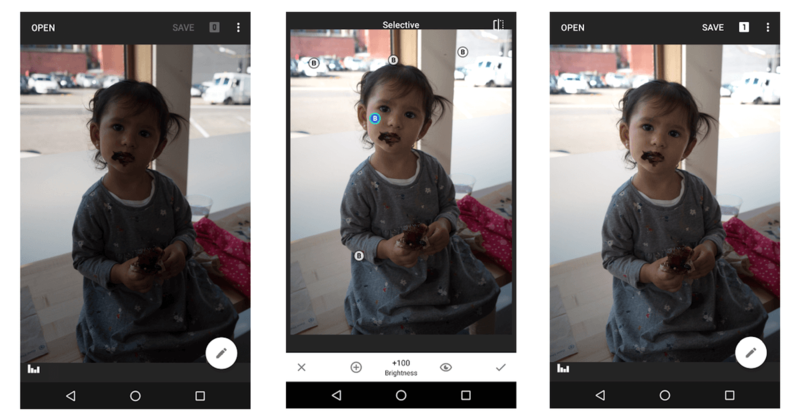 To get started on Snapseed, click “Open Photo” on the main screen, select the photo you want to edit and click the pencil mark on the right bottom corner. This will lead you to the main Tools screen. From there you can select the editing functions and swipe your finger up and down or left to right to edit your photo. Pretty easy, right? According to a research done by Yahoo Labs on 7.6 million Instagram and Flickr photos, the results show that most people like exposed, bright and cheerful photos. 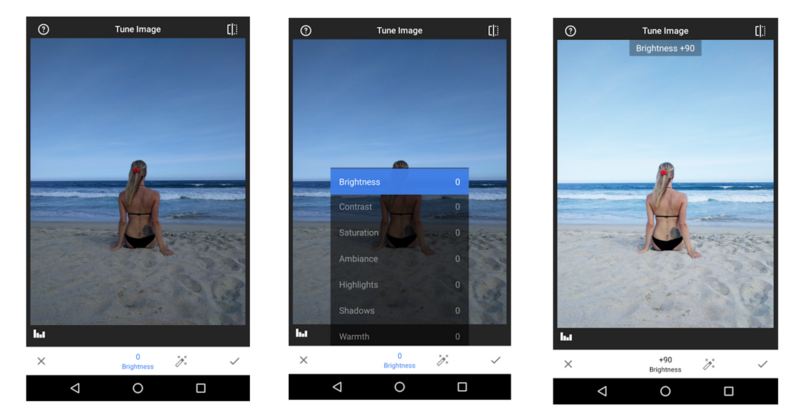 To brighten your photos on Snapseed select Tune Image under the Tools screen and swipe your finger up and down to find Brightness function. 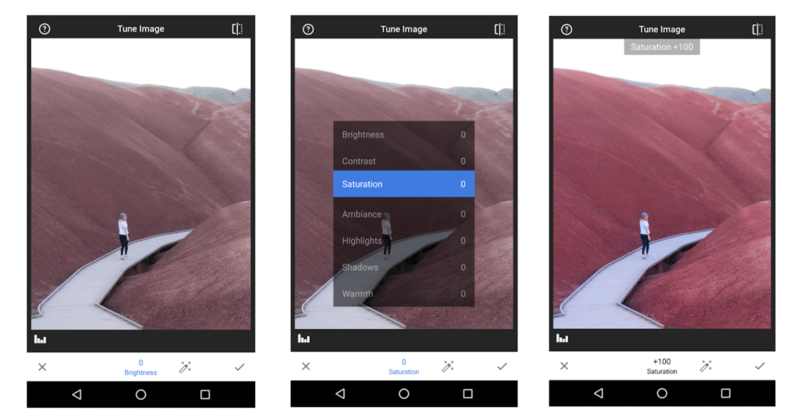 Once you select the Brightness function, swipe your finger to the right to brighten your photo, or to the left to darken it. Below is an example of a photo before adding brightness and after adding 90+ brightness in Snapseed. With a simple edit, you can enhance a photo to have the perfect vacation beach vibe in just a few seconds. Posting colorless pictures on Instagram won’t draw the eye and will get lost in the feed. However, overdoing color and saturation can also backfire – the trick is to add color to the pictures without making them look too fake or edited. Just the right amount of saturation can make or break a photo. For example, let’s look at this photo of Painted Hills in Oregon. By adding more Saturation under Tune Image options and swiping to the right, the photo looks a lot more lively and dreamy. It will stand out more in the Instagram feed and will attract more likes and reposts. Contrast is a great function to use if your photo looks washed out and you would like to add more depth to it. To add contrast, select Tune Images under the Tools screen and scroll your finger up or down until you land on Contrast. Then scroll your finger to the right to add contrast or to the left to make your photo look more washed out. In the photo below +80 contrast was added to make the trees colorful and dark which draw the eye to focus on the white waterfall in the middle. The Ambiance is sort of a “catch-all” function in Snapseed. If you don’t want to mess with brightness, color, and contrast on your own, try the Ambiance function under the Tools screen. By swiping to the right, the ambiance function will instantly add pop to the photo by brightening it, adding more color and removing contrast. By swiping to the left, the picture will have less light and color but more contrast. In the example below 100+ ambiance has been applied so it’s very bright and uplifting. The optimal size for an Instagram post is a vertical photo with a 4:5 ratio (1080×1350). A vertical photo will always show more detail and space than a horizontal or square photo and is much more likely to catch the attention of the viewer. If you post horizontal or square photos, you’re losing out on 58% or 48% of the area versus a vertical 4:5 photo, respectively. Here is an example of horizontal versus vertical photo edited using the Crop function under the Tools screen options. Cropping to a vertical photo can also allow you to get rid of empty space that doesn’t add any value to your photo. To crop a photo, simply hold down your fingers and move inwards until you receive the desired look. One of the coolest but trickiest applications of Snapseed is the healing function. The healing function can help you get rid of any unwanted parts in the photo like people, cars, buildings or anything else you want to remove. For example, in the photo below I would like to remove the two cars in the background so the focus of the photo is on the landscape. To do that, open the Healing function in the Tools screen, zoom into the area you would like to cover up and simply tap or drag your finger over that area. The Healing tool can be a bit tricky because Snapseed automatically chooses the area from which to select the cover up. If you don’t achieve the desired look on the first try simply undo the patches and try different angles and zoom until you get the right look. 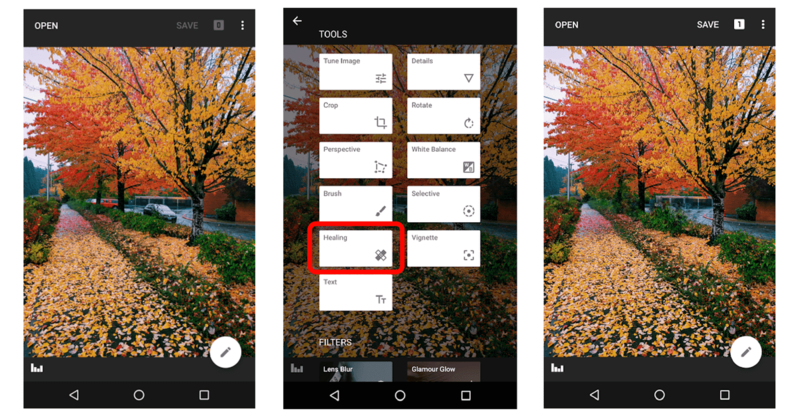 The brush function under the Tools menu allows Snapseed users to target specific areas of the photo for certain edits such as saturation, temperature, exposure, or dodge and burn. This tool is helpful if you don’t want to edit the entire picture and instead want to modify only a portion of it. For example, the photo below would stand out more if some parts like the water, shirt, and paddle would have more color. To add more color, select the Brush tool and saturation at +10. Then drag your finger over the desired areas like the water, shirt and paddle and the saturation brush tool will bring out more color in those areas. If needed, zoom in to color in the smaller areas. However, after adding +10 saturation, the water color still looks a bit dull. To make it pop more select the temperature brush and move temperature to -5. Negative tones in temperature will make the photo look more blue and positive tones in temperature will make the photo look more yellow. Drag your finger over the water and the Snapseed brush tool will make the water look a cool blue. 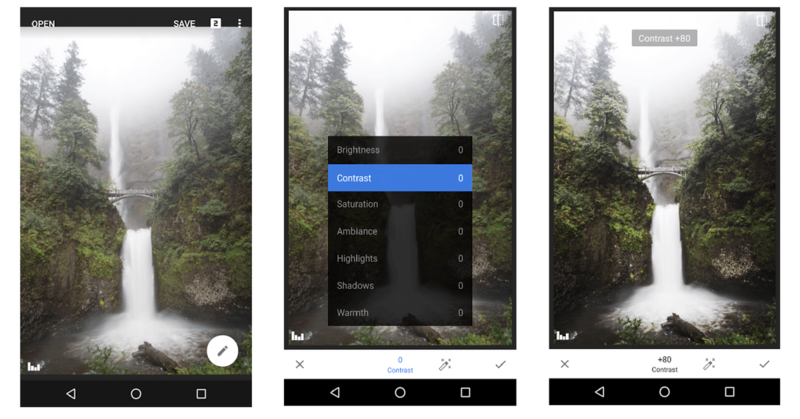 Snapseed’s selective function under the Tools menu allows modifications to certain parts of the picture with brightness, contrast, and saturation. By tapping the picture, a dot will be placed on the desired area and from there swipe your finger up and down to select brightness, contrast, or saturation. Then swipe right and left to enhance the photo. Click + to add another dot to the photo to edit multiple areas of the photo. In the example below multiple dots were placed on the photo and brightness was increased to 100+ for each dot to brighten those specific areas. The perspective function can add more space in the photo or elongate certain parts of the photo which is great when you accidentally get too close to your subject. In this example, we will add more background surroundings in the beach picture so the subject looks farther away. To do so, pick the Perspective function from the Tools menu. Drag your fingers inwards until you reach the desired size. 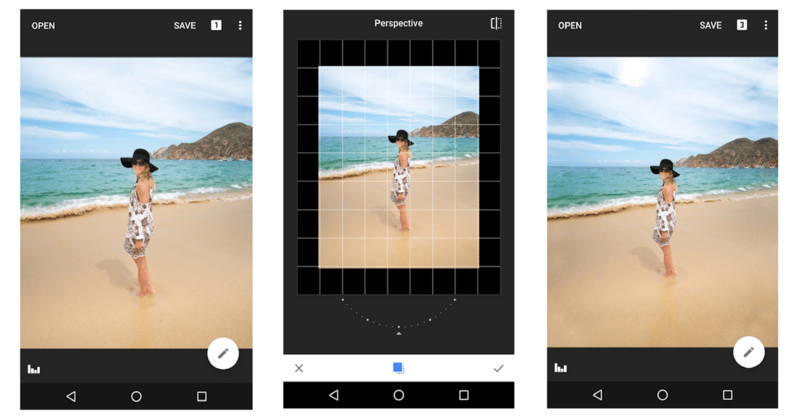 Once you release, Snapseed will automatically fill in space on all sides of the photo in the black area. If anything looks off, use the healing tool discussed in Section 6 to fix any spotty areas. 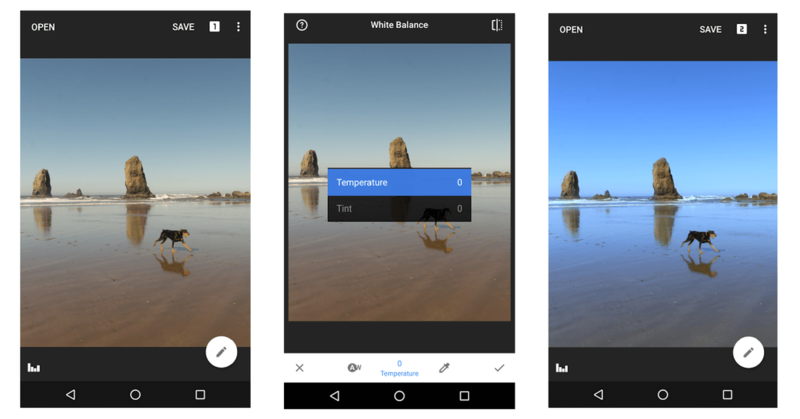 The white balance function under Tools menu allows Snapseed users to adjust temperature and tint in one sitting. Positive temperate will make the picture look more yellow and negative temperature will make the picture look more blue. Positive tint will make the photo purple and negative tint will make the photo green. Positive temperature is great if you would like to make the picture look sunnier, however in our example below the cool blue tint looks pretty fitting. To edit your photo go to Tools menu, select White balance and swipe your finger up and down to pick Temperature. Then swipe your finger to the left to add cool blue tones to the photo. In the photo below -70 temperature was added to make it look blue, but then brush tool was used to add positive temperature back to the rocks to make the photo look more natural. 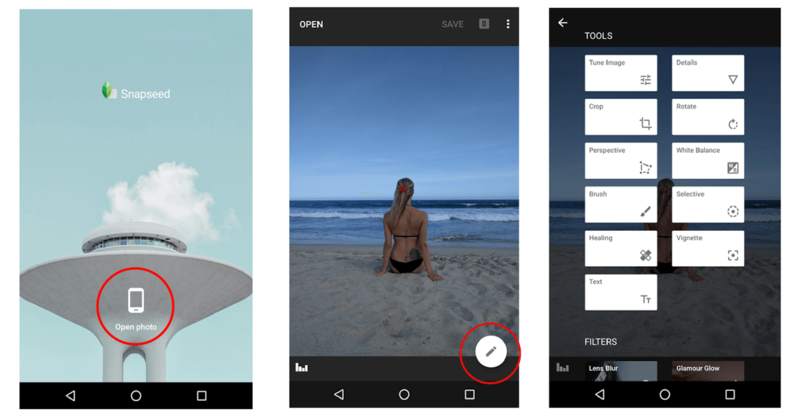 Snapseed is a powerful photo editing tool that can allow you to edit your phone’s photos in just a few minutes with a couple of simple swipes. It is extremely easy to use, it is FREE, and it can be downloaded on both iPhones and Androids. You don’t need an account to set it up, so get started today and see why so many people are loving it already. Excellent post. I use Snapseed as my number 2 app in my editing workflow for my Instagram account. This was an excellent clear summary of the key functions of snapseed. Awesome! I am glad you found it helpful : ) I love your Instagram pictures, great account! @Fred mind sharing which is the number 1 app you use for editing pics? thanks in advance. Many thanks Laura. This article on Snapseed was pretty informative and helpful ? Hi, Troy! Glad you found it helpful! Snapseed is great! I use it on every picture I post! It is incredible! It’s the first editing app I ever installed and I’m so glad I did! Excellent post! 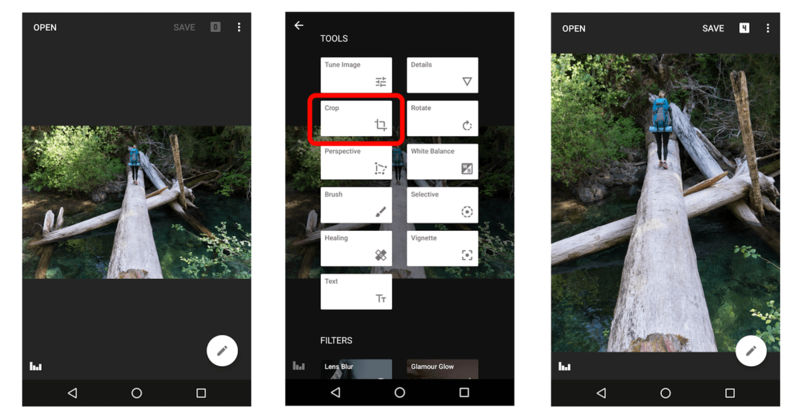 Snapseed allows you to save and share your custom created presets as QR Looks. Glad you found it helpful, Jeffery!